The U.S. Army will not be very successful in the coming operating environment unless it develops a sense of strategic understanding in its officers (and senior non-commissioned officers). For the purposes of this essay, strategic understanding is defined here as: awareness, comprehension, and ability to communicate broad purpose for the use of force and the relationship between tactical action and national policy. Trends tell us two things that demand this characteristic: first, landpower is inherently attributional; second, the Regionally Aligned Forces model ensures that the American Army will go to more places, faster, in smaller numbers, than ever before. Inadequately preparing for these landpower trends will lead to both institutional and individual epic fail. “Ours not to wonder why, ours but to try and stay dry,” quips the lieutenant standing nearby, carefully maneuvering a lid onto his overflowing caramel latte. This lieutenant’s response is a favorite in the officer corps, most likely due to its use by the infamous Corporal Oppum in Saving Private Ryan. I’ve actually heard it several times from cadets in the Military Strategy class I teach. In this case, the paraphrase of Tennyson’s “The Charge of the Light Brigade” was just a bit off — a more exact quotation would have been: “Theirs not to reason why, Theirs but to do and die.” Unfortunately, this line is often employed to propagate a great lie — that “the reason why” does not (or should not) matter to the uniformed military. Nothing could be further from the truth. “The reason why” matters, particularly in the landpower domain. For support, just spend some time with Civil War-era soldiers letters, as historian James McPherson did in his Lincoln Prize-winning book, For Cause and Comrades. In this case of sustained land conflict, morale mattered greatly in fueling unit effectiveness far beyond what most would predict. One review found that McPherson shows us “Confederate soldiers acted largely out of the conviction that they were defending rights and liberty, and that Union soldiers believed that self-government everywhere — and their own freedom in particular — depended upon upholding the Republic against division and anarchy.” Though this analysis of the American Civil War is not generalizable to all cases, this distinct sustained landpower combat provides a data point in favor of the importance of cause to armies. Even if one remains skeptical — what follows are two facts about the contemporary landpower operating environment that ought to sway the uncommitted towards the importance of strategic understanding for all officers. Consider the statement above in relation to the cyber domain, where attribution is either challenging or impossible. The most recent evidence comes from Russian intervention in Ukraine. It would be hard to imagine a more concerted effort to veil sustained landpower operations (which the Russians call Maskirova or “disguised warfare”). President Vladimir Putin continues to claim “There are no Russian units, special services or instructors in the east of Ukraine.” This military deception may have been believable in another era, but Ukraine has called President Putin’s bluff with the release of photographs proving that Russian special forces are operating in Eastern Ukraine (see below). In the Autumn 2013 edition of the U.S. Army War College journal Parameters,Brigadier General Kim Field (with two co-authors) wrote to describe “Regionally Aligned Forces” (RAF): “RAF is the [Chief of Staff of the Army’s] initiative for aligning Army capabilities to an expanded set of requirements for the Joint Force — post-2014.” In short, this means lower-level units will increase focus on the Army’s “shaping” mission and have closer habitual relationships with the geographic combatant commands. The Army intends to change the strategic context in which soldiers operate — at a faster pace than in previous eras. This becomes common sense after a quick glance at succeeding American military generations in major interventions: great grandpa deployed to fight one enemy (Imperial Germany); grandpa may have fought two (Germany/Japan — Korea); dad may have fought three or four (Vietnam — Gulf War — Bosnia/Kosovo — Iraq/Afghanistan); RAF likely expands this number further. Beyond the total, the conflicts, countries, cultures, geographies, missions and national interests will shift more rapidly. When the strategic context moves, mistakes are more likely and will be broadcast to the world. The Army’s tactical doctrine for “mission command” is not enough — a sense of strategic understanding provides the balance necessary to be successful in this Rubik’s Cube of shifting environments. Come back to the lieutenant in Kuwait. Whether he meant his comment as a joke or not will likley never be known (perhaps someone should ask Rosa Brooks). Either way, his response indicates a serious ambivalence to cause (“ours not to wonder why”). This is the professional compass of the mercenary. Most readers will not care about or be disturbed by this point, however, it seems the U.S. Army ought to be concerned. But the organization need not worry for the sake of one sarcastic, expensive flavored-coffee drinking lieutenant. This is bigger: the U.S. Army will not be very successful in the coming operating environment unless it develops leaders with a sense of strategic understanding — both RAF and the ability to conduct sustained landpower missions are at stake. Matthew Cavanaugh is a U.S. Army Strategist and editor of the WarCouncil.org, where this blog was originally posted. The views expressed belong to the author alone and do not represent the U.S. Army, the Department of Defense, or the U.S. Government. 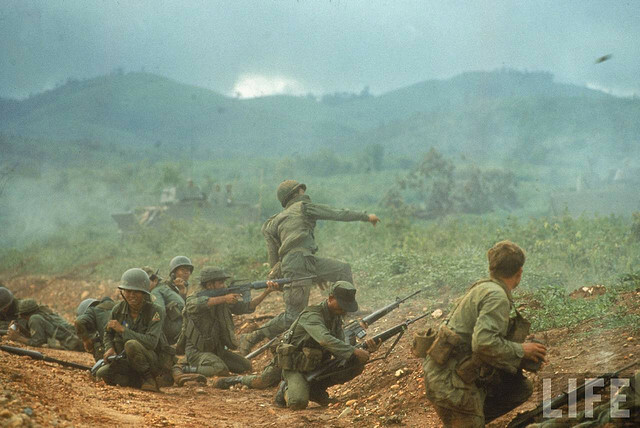 Header Image: Image courtesy of Life Magazine and the Modern War Institute (Vietnam History in Pictures). Newer PostWhy The Periphery Matters: Have you ever heard of Epidamnus or Potidea? Older PostNATO’s Pivot to Russia: Cold War 2.0 at Sea?